"My work is primarily focused on nature and the natural world. I am intrigued by this subject matter because I believe that a connection with nature is a mechanism by which we may better understand the mysteries and revelation of creator God. Currently, my artworks have become a means to explore and highlight nature’s ability to perplex scientific conclusions. The origins of ancient belief systems that have influenced modern scientism and the tensions caused by opposing and contradicting worldviews have become my latest area of focus. I often touch on ideas surrounding the historical fallibility of scientific theories, philosophy, and environmental concern. The use of silver and gold leaf with my oils plays an important role in transforming and elevating my subject matter and serves as a connection to the past." Marc was born in Pretoria, South Africa, but now lives and works in Cape Town. He is best known for his hyper-realistic portraiture and wildlife paintings. Marc qualified and worked as a Museum Technologist and Curator for the Pretoria Art Museum. He paints mostly in oils in the style of the traditional realist, but he also enjoys combining the art of gilding and texturing in his paintings. He aims always to capture and express subjects and themes about our world and the human condition, especially those themes that challenge the way we live. His interest in art started when as a young child, he discovered an ability to replicate on canvas with accuracy what he saw in nature. In December 1994 his career as the Museum Technologist at the Pretoria Art Museum and within two weeks began a reproduction of a 17th Century Dutch Master’s painting. Since that time he has made near-perfect replicas of some great pieces. It was also during this time that he started a work amongst orphans and vulnerable street children, using art as a medium for healing. This turned into a very successful not-for-profit organization called ‘The Tshwane Art Kids’ which brought healing and restoration to many Children. 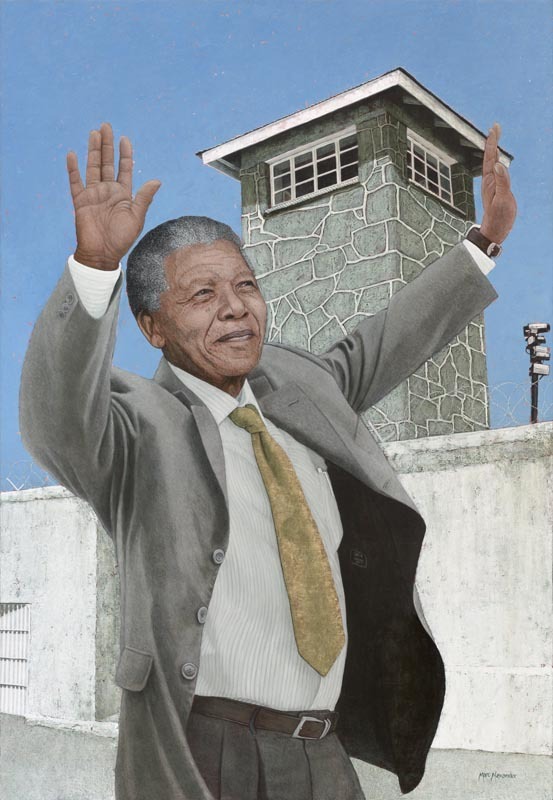 In 2010 – 2012, Marc focused on South African heritage and iconic portraits of late President Nelson Mandela. During this time he produced his acclaimed Legacy Series. Marc is a forerunner amongst South Africa’s contemporary artists and has a substantial international following of collectors. Since August 2015, Marc and his wife Lindy have been directing and managing The Studio Art Gallery, which they now own. This gallery has become a sought-after contemporary art space with a dynamic exhibitions calendar.